The story ‘How Abu Hasan Brake Wind’ from the 1001 Arabian nights (the story of the 410th night), Version by Richard F Burton goes thus – It is one of the many fascinating stories set between the 9th & 14th century AD, and outlines how one Bedouin widower moves from his village to the city, becomes a wealthy Hadhrami trader at Kaubakkan in Yemen, marries again, and on his wedding night fills himself with so much drink and food that at the most inopportune moment lets loose a great and terrible fart, only to lose face in front of his beautiful wife & many relatives & friends. So embittered does he become that he leaves the scene and sails away, sniveling bitterly without even spending a minute with his wife, to the port where he sees a ship waiting to sail to Calicut in Malabar. He reaches Calicut, meets many other Hadhramites and is introduced to the Zamorin who makes him the captain of his bodyguards. There he lived for 10 years, always yearning for his hometown and so returns one fine day, again without telling anybody. In a beggar’s disguise, he wanders around before going home, with just one hope - that nobody remembers his farting incident. He stops to rest near a hut and hears a young girl asking her mother inside if ma could tell her when she was born. The mother tells “of course my girl, it is easy to remember that, it was on the day Abu Hasan farted”. Abu Hasan hearing this is mortified and leaves Yemen again, going back to live his last sad years in Calicut. That story, true or fable coupled with the remnants of history, establishes the ease at which an Arab could sail to and settle in Calicut in those days, just like how a young man from Calicut can settle in Dubai (though not sail to), today…..But this is not about farts and Dubai, it is about Beypore in Calicut, a port popularized by the Yemeni Hadhramites. The story of Abu Hasan being a captain etc may be just that, but many Hadhrami’s came to Calicut around the early 18th Century (Frietag & Smith) and became the first Sayyids & Thangals. Much before them was the Adenese Arabs and Jews and so many other nationalities. Some of the mercantile Hadhrami’s tracing their roots to Al Mukkalla for example are the Al Jifri’s and Baarami’s of today’s Calicut & Beypore. But more on all that later in this article - let us first establish perspective. The Indian Ocean trade started from ancient times and strengthened during the medieval times. While in the old days Malabar directly traded with the Greeks and Romans, it concentrated on exchanges with the Middle Eastern ports in the medieval times. This exchange of goods resulted also in transfer of people from their abodes. 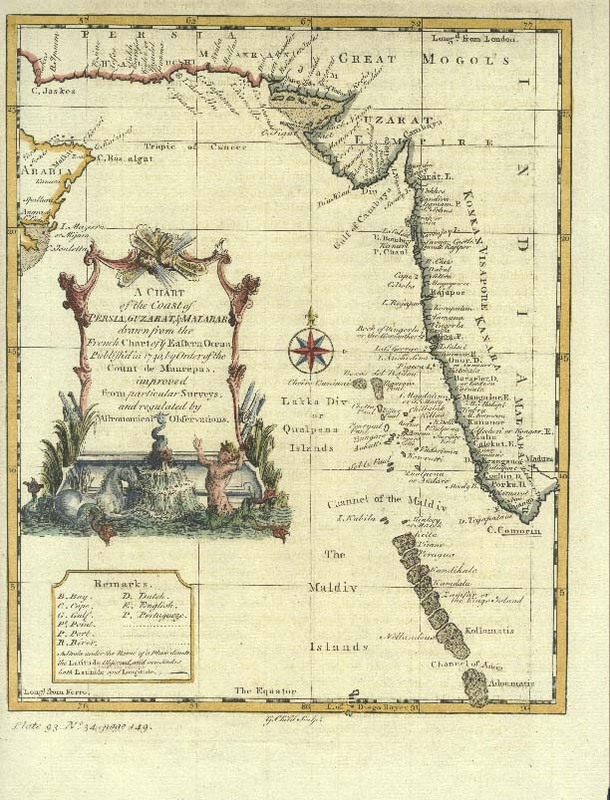 While it is mentioned that Malabari’s were found along African ports and even Egypt’s, it was mostly Arabs who migrated to the Malabar coasts, mainly to administer, control and conduct the trade with their brethren in Yemen, Basra and Egyptian ports. The ports around Calicut were virtually free ports with only an export import duty imposed by the ruling Zamorins. The intermediaries between the Arabs and the Nairs were the Moplah’s (themselves a community started by the intermingling Arab men and local women from ancient times). Also the SE Malay ports sent ships to Malabar for the cloth from Kerala, until British cloth took its place later in the 19th century. It was also a stop over for Hajj pilgrims from SE Asia. The Arab settlers in Malabar even had African slaves during that period. We now go to Beypore, some 10 miles south of Calicut where it all began. Beypore was the headquarters of the ancient Parappanad Rajas and their dilapidated palace can still be seen, I believe. Beypore was also that village writer Vaikom Mohammed Basheer (fondly known as ‘Beypore Sultan’)went to ‘‘so that his dreams became his address’’. Some days ago, we talked about Aden trade and Abraham ben Yiju. This time we go a bit north East of the Red sea ports, to Hadhramaut. Hadhramaut is a historical region of the south Arabian Peninsula along the Gulf of Aden in the Arabian Sea, extending eastwards from Yemen to the Dhofar region of Oman. The people of Hadhramaut are called Hadhramis. During the days the Omani’s and Hadhramis traded with Calicut in the early 18th century, many Moppilas themselves were of Hadhrami descent (I believe also that the famous Malabar biryani can be traced to the Hadhramite Mandi rice – more on that another day). One of the names mentioned in history is Yemeni Syed Muhammed Al Zahir who left Hadhramut in 1830 and settled in Malabar. His son Abdul Rahman was one of the big names of Malabar trade in the later parts of the 19th century and became a kingpin of mercantile relations between the red sea ports and Malabar (even controlling the Dutch Sumatra war of 1873). The Baraami’s were the ship builders in Beypore. Local teak wood was used for manufacturing the dhows. These Baramis can be traced to the Al Mukalla tribe in Egypt and struggle to continue the ship building in Beypore. Beypore was where the great Urus and the tough Dhows were built. They were the mainstay of the spice trade between the sea coasts of Malabar & Arabia. Here was where master craftsmen (Maistry) or the carpenter breed called Khalasis crafted these wonderful ships with the aid of no modern tools like charts or instruments, but from memory & mental calculations. 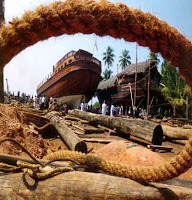 The old ships were crafted from Malabar teak (see my note on Malabar teak – the teak logs came down the Chaliyar river to the boatyards) but sadly now we import a variety similar to Irul, from Malaysia for price (a fifth of the price) reasons. It was from these Malabar shores that the first migrants to the Gulf launched themselves on a long lasting exodus, when young men desperate for jobs smuggled themselves out of the country in long country boats called uru’s which took cargo to the Gulf ports. Do you remember Mammu koya in Nadodikattu (see the attached youtube video) - Remember the song ‘Kara kana kadalala mele’? Watch Srinivasan and Mohanlala taking the Uru trip. The Beypore area is today home to the Mappila khalasis, famous for their expertise in lifting heavy weights. Till today, when machines and bulldozers fail, the khalasi teams are called on. Using little more than a wooden pole used as a dower or winch and leveraged by hawsers and pulleys, they move and lift huge masses. The Mappila khalasis were traditionally employed in launching the 400 tonne Arab dhows built at the Beypore docks but now are masters in hauling heavy wrecks. An exciting fact about the ship-building industry in Beypore is the way in which the craft are built and the variety which can be found. The flat bottomed zambuk, the majestic breek (both Indian and Arabian designs), the boom which boasts of an enormous cargo carrying capacity, and the bahala with its beautiful and intricate carvings and arches, are all made using traditional tools and techniques. Even more incredible is the number of people dependent on this industry. More than 500 families are directly and indirectly dependent on the ship-building industry. Special methods used from historic times were the use of wooden dowels instead of nails, use of coir rope and tar to seal joints etc…Duarte Barbosa first recorded (around 1500 AD) manufacture of keeled ships boats carrying 1200 bahares burden (some 400 tonnes) in Beypore. He also noted that they had no decks. They were classic sewn boats of teak wood (both of which were at that time only available in Malabar – in this context). The caulking was done with shavings off the palm trees and the ships were coated with shark oil or castor oil for waterproofing. It was the previously described people from Oman, Hadhamut, Yemen & Gulf – Iran who settled in Malabar to build these first Sanbuqs. The Hadhrami Sayyids, built the first ships in the 18th century with the Handramut techniques. Trade shifted from Basrah in 1773 to Kuwait and Qatar. Later Muscat & Jeddah took over; even the aristocratic Baghla was built in Malabar in the 19th century. 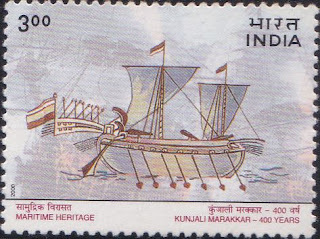 The Kuwaiti & Omani Bum’s like the ‘the light of the earth and sea’ (the named ship was built in Beypore with Kuwaiti architects & Indian carpenters but did not become a popular ship though). Kambari’s were built using mango wood. Badan’s had the stitched patterns and so on. Once the Arab traders discovered wealthy Kerala, her willing craftsmen and her native teak plantation centuries ago, they shifted their dhow construction to Beypore. This industry thrived till Iron & Steel took over the ships medium of construction. When the Price of Wales toured Beypore with Logan, he mentioned seeing Moplas, and Robinson explaining that they were of Arab extract & untrustworthy (Russel & hall – Pg 216). The very first ship built by the British in India was launched in 14th Nov 1803, named Duncan in honor of the governer of Bombay. It was a 400 tonne teak boat, but the difference was that nail and tar were used in construction. The tar itself was extracted from the teak sawdust (considered superior to Norwegian and other imported tars) . Information sourced from ‘The good old days of Hon John Co – WH Carey, pg 118. Beypore was formerly known as known as Vaypura / Vadaparappanad. Tippu Sultan later named the town “Sultan Pattanam. Here was where in 1837, they found an iron box in the riverbed with a huge cache of gold coins with Ceaser’s face on them (some coins as old as 2 BC and some dated later to 50 AD) Source WJ Richards – Indian Christians of St Thomas Pg 69. A remarkable feature of the technology of Uru making is that, there are no documents, work plans, technical data sheets or drawings right from the concept stage to completion. The construction details are assigned on a day to day basis to the assistants and carpenters by the master carpenter or Maistry. No electrical tools or heavy machines are used. The basic tools are the indigenous carpentry tools. All heavy lifting is done using elaborate pulley systems. Another amazing feature is the pre calculated water line marked around the hull, will be precisely on the water-level while the boat is launched. The master craftsmen of khalasis apparently use certain shlokas (or are they Arabic verses?) as their guide to ship building. Even today, the formula of dhow making remains a closely guarded secret that is handed over from generations to generation. Today, only as few as four master craftsmen are left behind. Today you can see Beypore dhows in action in Dubai, though not usually around the coasts of Malabar. You can see them come and go in the creek; you can even board one of them. Radha Nair sets a beautiful perspective in her Deccan Herald article ‘Romancing the Uru’ (more detailed Outlook traveler article by her as well). Beypore town today is dotted with dozens of shops that sell model ships and one can notice iron anchors lying on either side of the road, which are tell tale signs of this flourishing industry. According to Captain Iwata, founder member of the Association of Sumerian ships in Japan, Sumerian ships might have been built in Beypore. There are evidences to prove that Beypore had direct trade links with Mesopotamia and was a prominent link on the maritime silk route. Read these lovely set of articles on Sailing in a Dhow . Some Extracts from above link - Various types of ships were built in Beypore. Some of them were: Boom , Padavu , Bireek , Kottiya , Sambook , Bahla & Pathemar . The Beypore ships were usually around 300 tonnes and sometimes 600 tones. Today’s manufacturing methods are slightly different – Nails are used. 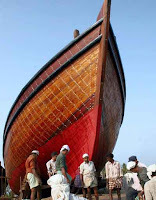 The ‘Keel’ is the first part of a dhow to be made. The second phase of work is concentrated on the second layer of the dhow from the bottom called ‘ganel’. Iron and copper nails are used to hold the wood together. Filling the gaps using quality cotton is the next tiring phase of work. It is a very time consuming process that has to be done with absolute care. Making of ‘chukkan’ is the third part of the construction. The ‘Chukkan’ begins from the keel itself and its height would be the actual height of the dhow. ‘Chukkan’ provides the total control of the vessel. Then the inside part of the dhow ‘deck’ and, finally ‘aruthi’ is made. The manufacturing process is completed with the tying up of the sail ‘mat’ (paya) to the mast (chamaram). The launching of a ship is a festive ceremony, attended by a large number of people. First, a prayer is said by the Qazi. When a Dhow was ready for launch wooden planks were kept up to appropriate height. The logs of the Puvathi tree serve as rollers are put on either side. Over these roller beams (Balus) strong enough to support the ship are kept. The gap between the beams and ship are filled tight with ropes. Then the ship is allowed to slowly move over the rollers with the help of rope and pulleys. In water they dip exactly up to the water mark earlier drawn by the Baramy. After the successful launch, a feast is laid out for all who have contributed to the ship building effort. An interesting look back at the old times - ‘‘The cry would go out ‘the Omani has come, the Omani has come’ and we would leave everything behind and run to the beach. For weeks thereafter, the nakudah (ship’s skipper) and his men would roam the streets, eat at our homes and we children would accompany them as they haggled over the purchase of cordage, hawsers and various items of ship chandlery for their return journey,” said Libero, recalling a not-too-distant past and Beypore’s pivotal place in the age-old East-West trade. Snippet – Vaikom Mohammed Basheer – Amongst the many things he did to live, he even found himself sailing as a khalasi on SS Rizvani carrying Haj pilgrims to Jeddah via the Red Sea. Alibayi a recent Malayalam movie set in Beypore & starring Mohanlal is based on the ship building families of Beypore. Notes: For an Arab a fart at the inopportune moment apparently has a disastrous face losing effect to his esteem. Scholars maintain that this Abu Hasan story was concocted by Sir Richard Burton who surreptitiously inserted it into his translation and does not actually figure in the original Arabian nights. Some others mention that it was actually removed from normal Arabic versions as it was not right for children. Whatever be the case, it is indeed an interesting story and apparently originates (it is either from ‘The story of a Quadi who bare a babe’ or the Muntafiq tribe’s ‘story of the Prince of Kermanshah and his misfortune’) from another collection of Arabian tribal fables. Speaking of dhows, if you are ever in Kuwait, check out the Al-Boom restaurant which is in a dhow built by Keralite shipwrights. The food is not too bad, either, and when you leave, they'll give you a massive iron nail that is a replica of those used in the construction of the boat. Thanks - Feanor - I read about the construction of this al-boom dhow actually and had a para about it in the original draft, took it out. and lo! you came in with the comment!! Hope the snow and the duvet days of London are still being talked about in the coffee shops. Thank you sir for such a beatiful article on the ship building industry of Beypore. It was fascinating to go through the antecedents of the people. I saw your blog quite by accident. I was looking for contact details of the Maistrys and your blog popped up in the search. I was told by a naval admiral that after the decline of dhow building in Beypore, the Maistrys (Narayana Maistry was the name given) have shifted to building boat models and made some nice business of it. Is it true? If yes could you suggest a means of finding their contact details? Thanks a lot for the information, My dissertation is on URU boats. Thanks PNS, telltale, Ahmed & hashrin. Anu, I replied you already - hope youe research goes well. You can also contact Sunail kumar. Thanks Sunil for the information. Hopefully those who are interested in this subject will call you also. Thanks for sharing this article. Vey informative.